China’s first airport logistics center—four buildings at Beijing Capital International Airport—was used by the Beijing organizing committee as the official logistics distribution site for the 2008 Olympic Games. Trade and commerce are the lifeblood of the global economy, and the logistics system is its circulatory system. Trucking fleets and container ships, railcars and terminals, RFID chips--logistics is the often-overlooked interconnected infrastructure that makes it all possible. And logistics real estate –warehouses, distribution facilities, fulfillment centers – stands at the center of this constantly changing system. The centrality of logistics to global commerce, and the underlying trends driving demand and change, make logistics real estate an attractive business. Prologis was designed to own, manage, and invest in logistics real estate, thereby building and creating value for investors – on a global scale. Prologis is the premiere global owner and manager of industrial space: $72 billion in total assets under management, 684 million square feet in 3,319 facilities, spread throughout 19 countries on four continents. Quietly ubiquitous, Prologis has operations in countries that represent more than 70 percent of global GDP. It serves 5,200 customers. By virtue of its scale, scope, experience and performance, Prologis has become synonymous with global logistics real estate solutions. In the past two decades, we have seen the rise of logistic real estate clusters—agglomerations of distribution centers that are concentrated in a particular geographic area. Clusters first emerged in North America, and, as best practices spread, are increasingly evident throughout the world. The growth of logistics real estate clusters is driven by three principal factors: The growth of consumer classes – driven by population, employment and wage growth – is the primary driver of the rise of logistics demand. Geographic positioning along global trade routes can also influence the formation and growth of logistics clusters. For example, regions that contain significant seaports or airports, or that are home to concentrations of particular industries (such as assembly plants along the Mexico-U.S. border) can require significant real estate clusters. The third force driving growth is the modernization of supply chains. As retailers, manufacturers, and distributors adopt new business models, such as e-commerce, and roll out best practices, they are rethinking the ways in which products flow from the factory to the consumer. These efforts are spurring the construction of logistics real estate in key areas—i.e. closer to large concentrations of consumers, or to vital distribution nodes. Other factors, such as the availability of land, the cost of labor, and levels of government support and incentives, can influence the development of logistics real estate clusters. 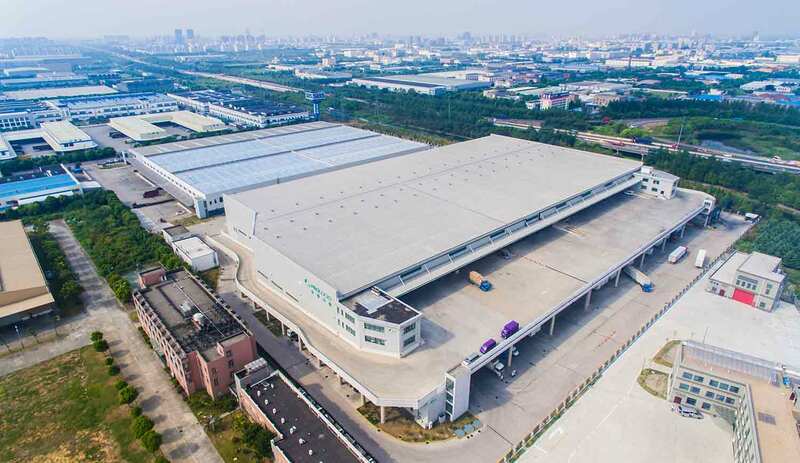 This logistics property, which has immediate access to major expressways, has been retrofitted to become a well-situated East China e-commerce distribution center. The U.S. is the world’s most-developed logistics market, and is home to some of the most significant clusters of logistics real estate. Since 2000, five broad clusters in the U.S. have accounted for about 60 percent of growth of the largest logistics real estate facilities: Central and Eastern Pennsylvania; Southern California; Chicago, Dallas, and Atlanta. In much of the rest of the world, by contrast, growth in logistics real estate has not kept pace with growth in consumption and trade. In Europe, where clusters are driven primarily by structural reconfiguration of the continent’s supply chain, construction activity is generally lower than in the U.S. Most European clusters have less than half the modern stock of comparable U.S. clusters. Clusters have developed in emerging markets like China, where the consumer class is growing rapidly. But the stock of buildings has generally lagged, thanks to slower development cycles and a lack of historical investment. In the coming years, logistics real estate clusters in vital markets around the world are expected to expand to meet continually rising demand.